On the picture above, Very strong silicification and minor alunite on a shallow epithermal system in Guanajuato. Picture by Jorge Cirett. During the 16th week of the year (April 16th to April 22nd, 2018), at least 20 press releases were announced by companies working in Mexico, of which two had information on exploration, five on first quarter production, three in financing, two on resources and development and seven in corporate issues. ON MEXICO ISSUES, No relevant news. ON EXPLORATION, In Jalisco, Evrim released impressive high-grade results from trenching at Cuale. In Veracruz, Mexican Gold released high grade samples from veins at Las Minas. ON MINING, McEwen, Fortuna Silver, Avino Silver, Telson and Excellon presented Q1 2018 production reports. ON FINANCING, Prospero Silver and Aura Silver respectively announced the opening and closing of financing rounds, while Excellon announced the exercise of warrants. ON RESOURCES AND DEVELOPMENT, SilverCrest released drill results from the Luigi vein at its Las Chispas property in Sonora. Levon Resources filed a PEA report with a new resource estimate on the Cordero project in Chihuahua. ON DEALS AND CORPORATE ISSUES, Monarca Minerals continues work to solve community issues in Tejamen, Durango. Geologix Explorations Inc. is to change name to ValOro Resources Inc.. Advance Gold acquired the Venaditas property in Zacatecas. Argonaut Gold informed on the legal struggle that halted the explosives permit use on its La Colorada mine in Sonora. Goldplay Exploration optioned the San Marcial property in Sinaloa. Vangold Mining and Mexican Gold granted options to officers, directors and consultants. Evrim Resources Corp. announced results from trench sampling at its Cuale project in Jalisco. Trench 4 grades 13.61 g/t Au over 106.2 m, including 50.0 m grading 26.13 g/t Au, including 7.5 m @ 163.3 g/t Au. Trench 2 grades 2.94 g/t Au over 29.4 m, including 17.9 m @ 4.55 g/t Au. Gold results over 10 g/t have been re-assayed. “Metallic screen assays reported acceptable repeatability with excellent repeatability at the highest gold grades”. A second IP line defines a 1,200 m long by 50 to 120 m deep highly resistive ledge associated with strong silicification and minor anomalous gold at the surface. Mexican Gold Corp. released initial sampling results from four veins on its Pueblo Nuevo concession, part of its Las Minas property in Veracruz. 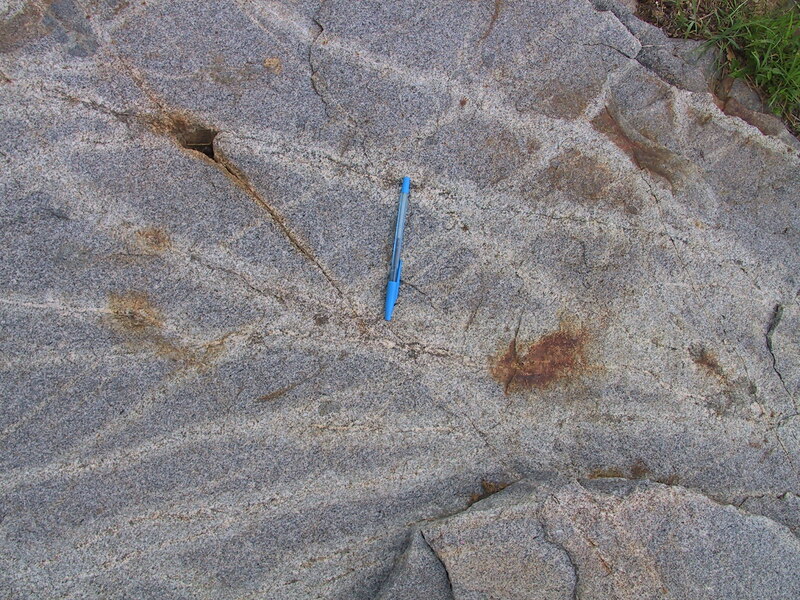 The veins are hosted in diorites with argillic alteration, occur as mesothermal quartz veins, 20 to 50 cm in width with sub-vertical dips and lack post-minerals deformation. The Tamiahua I vein assayed 90.82 g/t Au, 37 g/t Ag over 0.40 m, with the footwall and hanging wall returning 0.52 g/t Au, 1 g/t Ag over 1.0 m and 0.72 g/t Au, 1 g/t Ag over 0.80 m respectively. Nine samples at the Tamiahua II returned 2.05 to 22.82 g/t Au and 5 to 37 g/t Ag on an average width of 0.27 m (up to 0.50 m). At the Cajon vein a grab sample returned 32.2 g/t Au, 231 g/t Ag; while a 0.20 m chip sample assayed 3.53 g/t Au, 31 g/t Ag. At the Dos Rios vein, two 0.35 m and 0.18 m samples returned 3.86 g/t Au, 16 g/t Ag; 8.25 g/t Au, 59 g/t Ag respectively, while a 1.0 m hanging wall channel sample returned 4.92 m g/t Au, 38 g/t Ag. McEwen Mining Inc. reported consolidated production for Q1 2018, which includes figures from its Mexican operations. At El Gallo in Sinaloa, 12,217 AuEq Oz were produced during the period. Mining from the existing open pits will cease in Q2, while heap leach activities will continue until 2020, or as long as it remains economic. Fortuna Silver Mines Inc. reported first quarter 2018 production, including figures from its Mexican operations. At San Jose in Oaxaca, 258 K tonnes were milled, at an average rate of 3,011 tonnes per day (tpd) @ 284 g/t Ag, 0.2 g/t Au, and a recovery of 92.8% Ag, 92.3% Au, to produce 2.18 M Oz Ag, 14,882 Oz Au. Avino Silver & and Gold Mines Ltd. released first quarter 2018 production results from its Avino property in Durango. During the period 120.6 K tonnes were milled @ 56 g/t Ag, 0.58 g/t Au, 0.43% Cu, with recoveries of 81% Ag, 68% Au, 84% Cu, to produce 309.9 K Oz Ag, 2,065 Oz Au, 970 K Lb Cu. Telson Mining Corp. presented first quarter 2018 results from its Campo Morado mine in Guerrero. During the period the mill processed 148.7 K tonnes (approximately 1,650 tpd) @ 3.65% Zn, 0.41% Cu, 0.90% Pb, 1.14 g/t Au, 108 g/t Ag, with recoveries of 70.4% Zn, 23.0% Cu, 37.9% Pb, 17.9% Au, 28.3% Ag in the elaboration of distinct Zn, Cu, Pb concentrates containing 3,824 tonnes Zn, 140.5 tonnes Cu, 508.7 tonnes Pb, 970.9 Oz Au, 146.8 K Oz Ag. Telson continues to ramp-up production to the 2,500 tpd plant capacity. Excellon Resources Inc. presented first quarter 2018 production results from the Platosa mine, Durango. During the period 13,784 tonnes were mined, 18,885 tonnes milled @ 359 g/t Ag, 3.79% Pb, 6.43% Zn, with recoveries of 87.3% Ag, 81.2% Pb, 83.8% Zn, to produce 194.5 K Oz Ag, 1.27 M Lb Pb, 2.25 M Lb Zn. Prospero Silver Corp. is to complete a non-brokered private placement intending to raise gross proceeds of up to $1 M (Petate, Hidalgo; Bermudez, Chihuahua). Excellon Resources Inc. announced that 3.33 M warrants were exercised, for proceeds of C$2.17 M (Platosa, Durango). Aura Silver Resources Inc. is undertaking a non brokered private placement to raise gross proceeds of up to $600 K (Aranzazu, Zacatecas). SilverCrest Metals Inc. released drill results from the Luigi vein on the Las Chispas property in Sonora. The vein was discovered in mid-2017 and referred only as unnamed vein until further drilling delineated a prospective target. Relevant results comprise: 0.8 m (true width, or TW) @ 1.03 g/t Au, 151 g/t Ag; 4.1 m @ 1.71 g/t Au, 232 g/t Ag; 1.8 m @ 0.28 g/t Au, 221 g/t Ag; 1.4 m @ 13.22 g/t Au, 2,067 g/t Ag; 1.4 m @ 0.18 g/t Au, 172 g/t Ag; 1.6 m @ 3.41 g/t Au, 265 g/t Ag; 1.0 m @ 2.75 g/t Au; 231 g/t Ag. The Luigi vein high-grade footprint measures 300 m long by at least 75 m high, averaging 1.7 m in width @ 2.84 g/t Au, 417 g/t Ag. “The Phase III drill program also includes drilling several new and partially-drilled high-grade mineralized veins. An additional 15,000 to 20,000 metres of drilling are planned for Q3 2018”. The 672 ha Cuesta Blanca ranch was bought, with SilverCrest now owning two thirds of the surface rights on the Las Chispas property. Levon Resources Ltd. filed a NI-43-101 technical report with a resource update and preliminary economic assessment (PEA) for the Cordero project in Chihuahua. The project envisages a 40 K tpd operation with a 29 year mine life on 417.5 M tonnes of mineralized material @ 46.5 g/t AgEq, to produce 231 M Oz Ag, 2,863 M Lb Zn, 1,992 M Lb Pb, 0.35 M Oz Au. The base case economic estimate is an after tax net present value of $438 M, using a 7.5% discount rate, and an after tax internal rate of return of 16.5%, with a payback period of 4.8 years. Monarca Minerals Inc. presented a corporate update. At Tejamen, in Durango, 202 RC holes and 10 diamond holes have been re-logged to help in the design of a new drilling campaign. The company has involved the Federal, State and Municipal governments in its search of an agreement with the community regarding the surface rights. At San Jose, in Chihuahua, the LOI on the project was extended to July 2018. “Terms of the LOI call for payment of US$20,000 on execution of the LOI(paid), US$20,000 on execution of a definitive agreement, US$50,000 on the first anniversary of the definitive agreement and US$60,000 on the second anniversary of the definitive agreement. The owners retain a 2% NSR. One percent of the NSR can be purchased by Monarca for US$100,000. Back taxes on the property of US$390,000 will be paid over a period of time. Concession taxes per year are approximately US$46,000”. Geologix Explorations Inc. announced its intention to change its name to ValOro Resources Inc., subject to approval by the TSX-V, as well a 10 to 1 consolidation on shares (Tepal, Michoacan). Advance Gold Corp. announced the acquisition of the 2,365 ha Las Venaditas claim in Zacatecas, 11 km to the West of Advance’s Tabasqueña project, which is currently being drilled. “Upon receipt of regulatory approval, Advance will issue to Hot Spring Mining, a Mexican based corporation, 1,000,000 common shares which will be subject to a statutory four-month hold period, in exchange for which Hot Spring Mining will transfer a 100% interest in the Venaditas claims to Advance Mexico. Hot Spring Mining will retain a 2.5% NSR, of which Advance Mexico has the right to buy 1.5% at a rate of $500k CAD per 0.50%”. Advance will issue 800 K options to certain consultants and advisers. Argonaut Gold Inc. reported that the court has postponed “the hearing pertaining to Argonaut’s explosive permit at its La Colorada mine (see press release dated April 12, 2018) to allow the Secretary of National Defense (“SEDENA”) to provide evidence requested by the court regarding the temporary suspension of the explosives permit at Argonaut’s La Colorada mine. It is expected that a ruling will be issued within 15 business days of the original hearing date (April 16, 2018), as required by law.” (La Colorada, Sonora). Goldplay Exploration Ltd. entered into an option agreement with SSR Mining Inc. to acquire a 100% interest in the 1,250 ha San Marcial project in Sinaloa. San Marcial is a low sulfidation epithermal near surface high grade Ag, Zn Pb project with a NI-43-101 resource completed by Silvermex Resources Inc., with opportunity for resource expansion. The indicated resource holds 3.75 M tonnes @ 149 g/t Ag, 0.67% Zn, 0.36% Pb, hosting 18.0 M Oz Ag, 29.9 M Lb Zn, 55.3 M Lb Pb; and 3.07 M tonnes @ 44 g/t Ag, 0.51% Zn, 0.29% Pb holding 4.4 M Oz Ag, 19.5 M Lb Zn, 34.7 M Lb Pb as inferred resources. Goldplay has to pay SSR Mining an aggregate of $2.575 M in cash, issue an aggregate of 3.5 M common shares, incur in $3 M in exploration expenditures over a three year period and grant a NSR royalty (0.5% to 1.5%, based on a resource estimate). A NI-43-101 resource estimate has to be completed on or before the third anniversary of the agreement. Vangold Mining Corp. granted an aggregate of 4.8 M stock options to directors, officers and consultants (Pinguico, Zacatecas). Mexican Gold Corp. granted 174 K incentive stock options to directors and officers of the company. During the 3rd week of the year (January 15th to January 21st, 2018), 20 press releases were announced by companies working in Mexico, most of them reporting their Q4 and full year 2017 results. ON MEXICO ISSUES, no relevant news. ON EXPLORATION, In Sinaloa, Auxico reported encouraging sampling results from the Aguamas area at its Zamora project, and Marlin Gold announced positive drill results from the Colinas target area at its La Trinidad Mine, awaiting drill results for five additional holes from this area. In Sonora, Azure released drill results at its Oposura project, where near-surface, high-grade zinc-lead mineralization has been intersected, and Oceanus Resources reported the 2017 fall exploration drill results from its El Tigre project, and announced its intention to continue locating and defining other high-grade vein systems on the property. In Jalisco, Evrim Resources announced trenching results from its Cuale project, where high-sulfidation mineralization has been identified. ON MINING, Nine companies: McEwen, Goldcorp, Avino, Argonaut, New Gold, Premier Gold, Fortuna Silver, Sierra Metals and Leagold presented Q4 and annual production results for 2017, and announced 2018 production and cost guidance. ON FINANCING, Orla Mining settled debt with shares to certain creditors. SilverCrest closed a non-brokered private placement for $749,988. ON RESOURCES AND DEVELOPMENT, Torex Gold announced maiden Sub-Sill mineral reserves for 180K Oz Au and 180K Oz Ag and updated its mineral resource estimate on El Limón-Guajes Mine Complex in Guerrero to over 3.9 M Oz Au and 6.1 M Oz Ag and mineral reserves estimate to 3.0 M Oz Au and 4.3 M Oz Ag. ON DEALS AND CORPORATE ISSUES, Tonogold Resources entered into an option agreement with a private Mexican company to acquire Claudia, Promontorio and Montoros gold-silver properties in Durango. Galore Resources entered into a 5-year agreement with a private Mexican company to begin mining Los Gemelos property in Zacatecas state. Auxico Resources Canada Inc. provided results from an exploration campaign carried out on the Aguamas area at its Zamora project in Sinaloa. The Aguamas area contains brecciated material with quartz veins and stockworks carrying gold and silver values over an area of 150 m long and 70 m wide. Trenching sampling and grabs samples collected near old adits returned encouraging gold and silver values. Trench sampling results include 50m of 0.85 g/ Au, including 3m of 13.07 g/t Au; 14.4m of 0.79 g/t Au, including 2.9m of 3.44 g/t Au. Grab samples results include 34.05 g/t Au & 99 g/t Ag, and 14.87 g/t Au & 292 g/t Ag. Auxico plans to conduct a diamond drilling program at Aguamas as well as carry out more detail exploration work in the entire property which contains brecciated material over a strike length of 8 km across the Zamora project to evaluate its potential. Marlin Gold Mining Ltd. announced positive drill results from the Colinas target area, less than 1 km from the Taunus pit within its La Trinidad Mine. The drilling tested a low angle faulted vein zone interpreted to be a thrust fault which has been identified over a strike of approximately 180 m and a dip of approximately 40 m. This target is amenable to open pit mining. Three holes returned grades of 2.66, 8.42, and 7.17 g/t Au, respectively over a true width that varies from 2.37-3.65 m, and a single hole intersected 18.35m of 0.44 g/t Au. Marlin is awaiting drill results of five additional holes drilled on this target area. Azure Minerals Limited continued intersecting near-surface, high-grade Zn-Pb mineralization at its flagship Oposura project in Sonora. Drilling results include 2.0m @ 21.33% Pb and 21.23% Zn from 37.5m; 2.9m @ 9.68% Pb and 6.45% Zn from 18.9m; 2.1m @ 9.14% Pb and 6.24% Zn from 27.9m, and 2.2m @ 8.73% Pb and 5.47% Zn from 15.2m. The latest round of drill results has extended the high-grade mineralized zone to the south and west of previously reported near-surface, high-grade mineralisation in the East Zone. Mineralization remains open and drilling is planned for this area. Azure plans to deliver an initial mineral resource estimate by April 2018. Oceanus Resources Corporation reported drill results from the 2017 fall program at its El Tigre project in Sonora, which consisted of 600m to define the strike and dip of the high-grade Caleigh vein and the low-grade alteration zone in the hanging wall. Significant drill intersections include 0.75m @ 91 g/t Au & 2,830 g/t Ag from 28.50 to 29.25 m depth, and 0.50m @ 10.0 g/t Au & 2,247 g/t Ag. Oceanus announced its intention to continue locating and defining other high-grade vein systems on the property and plans, for the first time, to explore with mapping and geochemical sampling over a distance of 5 km to the south between Golden Hill and Lluvia de Oro prospects. Evrim Resources Corp. released the first trenching results from the La Gloria high sulfidation prospect within its Cuale project in Jalisco. Three trenches dug over a distance of 600m were sampled and returned results of 25.4 m @ 0.53 g/t Au; 9.4 m @ 7.4 g/t Au, and 20m @ 0.61 g/t Au. Evrim is planning a follow-up program that includes more trenching and geophysics. McEwen Mining Inc. announced fourth quarter and annual production in 2017 from its El Gallo Mine in Sinaloa, where 19,893 Au Eq. Oz were produced in the fourth quarter for a total annual production of 46,694 Au Eq. Oz during 2017. Goldcorp Inc. reported its preliminary gold production for the fourth quarter and full year 2017 of 646,000 Oz Au and 2’569,000 Oz Au respectively. No figures for its Mexican operations were released. Goldcorp also informed about its complete production and cost guidance to 2021 on their mines and projects. Avino Silver & Gold Mines Ltd. Informed about its fourth quarter and full year 2017 production. At Avino Mine, in Durango, 109,088 tonnes were milled @ 50 g/t Ag, 0.32 g/t Au and 0.52 % Cu with a recovery rate of 87% Ag, 69% Au and 88% Cu to produce over 320K Oz Ag, 1,472 Oz Au and 1.1 M lb Cu. During the full year, 460,890 tonnes were milled @ 64 g/t Ag, 0.52 g/t Au and 0.48 % Cu with recovery rates of 85% Ag, 69% Au and 89% Cu to produce over 1.4MOz Ag, 7,355 Oz Au and 4.4 M Lb Cu. At San Gonzalo Mine, 20,467 tonnes were milled @ 290 g/t Ag and 1.36 g/t Au with a recovery rate of 87% Ag and 77% Au to produce over166.7K Oz Ag and 69 Oz Au. During the full year, 81,045 tonnes were milled @ 269 g/t Ag and 1.32 g/t Au with a recovery rate of 84% Ag and 78% Au to produce over 591K Oz Ag and 2,675 Oz Au. Argonaut Gold Inc. reported fourth quarter and full year 2017 production from its Mexican operations. At El Castillo Mine Complex in Durango (El Castillo & San Agustín Mines), a total of 19,653 Oz Eq. Au (GEOs) were produced including 8,707 GEOs from El Castillo Mine and 10,946 GEOs from San Agustin Mine. La Colorada Mine in Sonora produced in the fourth quarter 15,334 GEOs. During the full year, 73,418 GEOs were produced at El Castillo Mine Complex and 53,286 GEOs from La Colorada Mine. Argonaut also provided 2018 cost guidance and three-year production outlook and plans to invest $50-$55 M USD in capital expenditures during 2018. The company also announced the hiring of Brian Arkel as VP Exploration. New Gold Inc. announced fourth quarter and full year 2017 production from its Cerro San Pedro Mine in San Luis Potosi, which finished active mining during the second quarter of 2016 and transitioned to residual leaching. During the fourth quarter, 7,177 Oz Au and 100K Oz Ag were produced for a full year 2017 of 34.3K Oz Au and 600K Oz Ag produced. New Gold also provided Production and Cost Guidance for 2018. Premier Gold Mines Limited Mercedes Mine in Sonora produced during the fourth quarter of 2017 over20K Oz Au and 77K Oz Ag for a full year 2017 production of 82.5K Oz Au and 338K Oz Ag. Premier announced that < 45K m of drilling was completed and a revised mineral resource and reserves estimate is planned to release in February 2018. Premier provided a consolidated production and cost guidance for 2018. 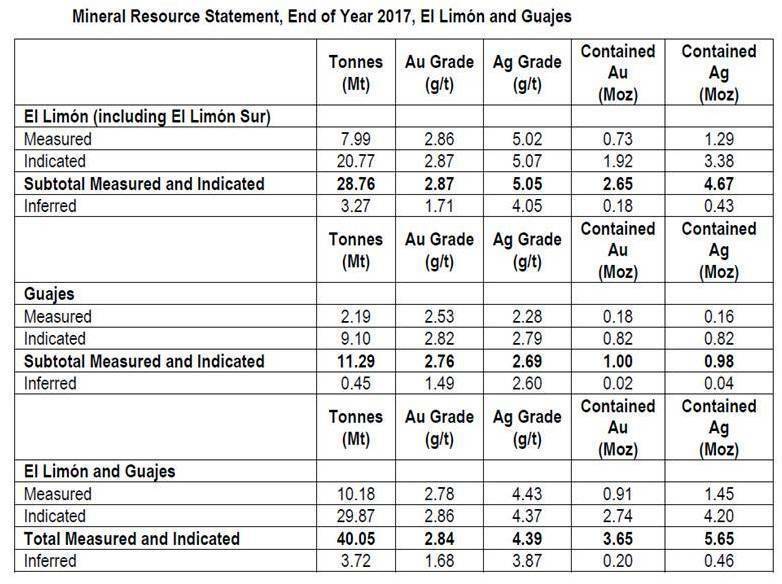 Fortuna Silver The San Jose Mine in Oaxaca produced over 2M Oz Ag and 15K Oz Au in the fourth quarter of 2017 from 271,370 tonnes with average grades of 259 g/t Ag and 1.89 g/t Au and recovery rates of 91.86% Ag and 91.82 % Au respectively. Silver and gold production for 2017 totalized 5 M Oz Ag and 55.5K Oz Au from 1.1 M tonnes with average grades of 238 g/t Ag and 1.77 g/t Au and recovery grades of 91.82% and 91.62% respectively. Fortuna issued guidance for 2018 for its San Jose Mine in Oaxaca. Sierra Metals Inc. announced fourth quarter and full year 2017 production of its Bolivar and Cusi Mines in Chihuahua. The Bolivar Mine processed in the fourth quarter 226,980 tonnes @94% Cu, 14.67 g/t Ag and 0.16 g/t Au with recovery rates of 83.3% Cu, 80.42%Ag and 55.62% Au to produce over 3.9M lb Cu, 84K Oz Ag and 791 Oz Au. 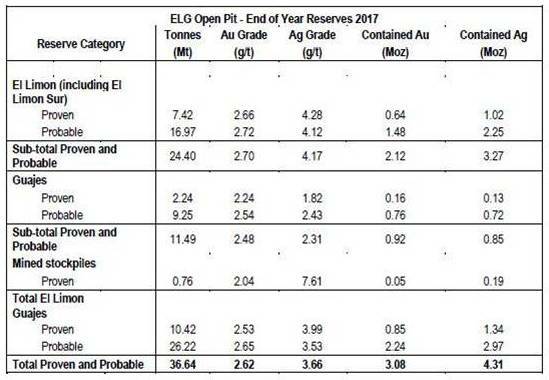 During the full year, Bolivar Mine processed 887,237 tonnes @ 0.96% Cu, 14.93 g/t Ag, and 0.17 g/t Au with recovery rates of 79.82% Cu, 76.88% Ag and 59.5% Au to produce over 15 M lb Cu, 327K Oz g and 2,88 Oz Au. At Cusi Mine, Sierra Metals processed 16,280 tonnes in the fourth quarter @ 178.6 g/t Ag, 0.25g/t Au, 0.97% Pb and 1.0% Zn with recovery rates of 88.15% Ag, 58.09% Au, 87.65% Pb and 42.50 Zn to produce 82K Oz Ag, 77 Oz Au, 305K Lb Pb and 152K Lb Zn. During the full year, Cusi Mine processed 88,011 tonnes @ 165 g/t Ag, 0.26 g/t Au, 1.12% Pb and 1.3% Zn with recovery rates of 72.17% Ag, 58.4% Au, 81.26% Pb and 42.56% Zn to produce 337K Oz Ag, 423 Oz Au, 1.7M Lb Pb and 937K Lb Zn. Sierra Metals also provided Production and Cost Guidance 2018 for its Bolivar and Cusi Mines. Leagold Mining Corporation provided 2018 Production and Cost guidance for Los Filos Mine in Guerrero. The company expects to produce 215,000 to 240,000 ounces at an all-in sustaining cost (AISC) of $875 to $925 per ounce. Within the same Mine Complex, the Bermejal Underground expansion project is underway with the decline having advanced to over 320m. It is projected to test mining stopes in mid-2018. Orla Mining Ltd. Orla Mining settled a debt of $206,783 to certain creditors after approval by the TSX Venture Exchange, through the issuance of 147,702 common shares of the Company at an issue price of $1.40 per common share. The issued common shares are subject to a four (4) month hold period ending on May 18, 2018. (Camino Rojo, Zacatecas). There are 6 mining areas in the Sub-Sill mine plan, that range in size from 40 to 100m length on strike, 40 to 200m on plunge, and 3.5 to 25m in thickness dipping at an average of 24°. Tonogold Resources Inc. entered into an option agreement with a private Mexican company to acquire 100% interest in the Claudia, Promontorio and Montoros gold-silver properties in Durango, for a total payment of $7.3 M $USD in cash. Grupo Minero Bacis calculated historical resources estimates (not NI 43-101 compliant) for each of the properties. Historic Measured and Indicated Resource for Claudia are 130K tonnes @80 g/t Au, 199 g/t Ag for a total contained metal of 15,891 Oz Au and 832,191 Oz Ag. Historic Inferred Resources are over 12M tonnes @ 3 g/t Au and 193 g/t Ag, for a total contained metal of 1.2 M Oz Au and 74.5 M Oz Ag. On Promontorio, Historic Measured and Indicated Resource are 37,800 tonnes @ 1.20 g/t Au, 382 g/t Ag, for a total contained metal of 1,500 Oz Au and 464K Oz Ag. Historical Inferred Resources are 1.1M tonnes @ 1.2 g/t Au and 370 g/t Ag for a total contained metal of 42.5K Oz Au and 13M Oz Ag. On Montoros, Historic Measured and Indicated Resource are 112.7K tonnes @ 2.90 g/t Au, 40 g/t Ag, for a total contained metal of 10.5K Oz Au and 145K Oz Ag. Historical Inferred Resources are 8.8M tonnes @ 3.5 g/t Au and 34 g/t Ag for a total contained metal of 990K Oz Au and 9.6M Oz Ag. Total Historic Measured and Indicated Resource for the three properties are 280.5K tonnes @ 3.9 g/t Au and 160 g/t Ag, for a total contained metal of 227.8K Oz Au and 1.4M Oz Ag. 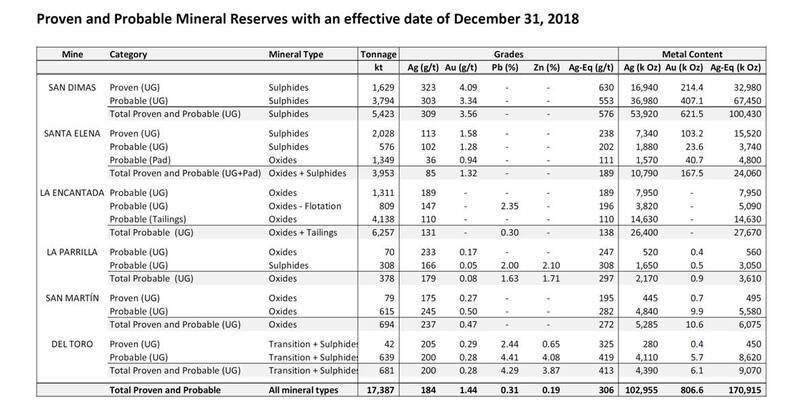 Historical Inferred Resources for the three properties are 21.9M tonnes @ 3.11 g/t Au and 138 g/t Ag for a total contained metal of 2.2M Oz Au and 97M Oz Ag. “Claudia covers a 10-kilometer hosting NNW trend of WSW and ENE dipping intermediate sulphidation gold-silver vein systems”. “The Promontorio Property covers several gold-silver bearing veins with the main Promontorio and Pericos veins reported to have produced ~250,000 tonnes of 3,500 g/t silver and 20 g/t gold during the 1930’s. The narrow, high-grade veins have been traced for more than 2 kilometres but previous exploration has mainly been conducted in a small area of the project”. “The Montoros Project consists of four vein systems and the alteration consists of propylitization (chloriteepidote- calcite-pyrite) that is more common in the Lower Volcanic Group rocks of the Sierra Made Volcanic Plateau and clay alteration near the vein tops. Mineralization occurs as argentite, native gold, electrum, and base metals. The Periquitos vein contained about 10% chalcopyrite in semi-massive sulphide at the portal. The Montoros vein systems were sampled on surface and by underground workings between 1992 to mid-1993. Galore Resources Inc. entered into a 5-year agreement with a private Mexican company to begin mining Los Gemelos property in Zacatecas state. Urbiaza, a private Mexican company will install a gold processing plant and will be responsible to mine and sell concentrated gold on a monthly basis, with any proceeds, net of costs, as reported by URBYASA, being allocated forty percent (40%) to Galore and sixty percent (60%) to URBYASA. 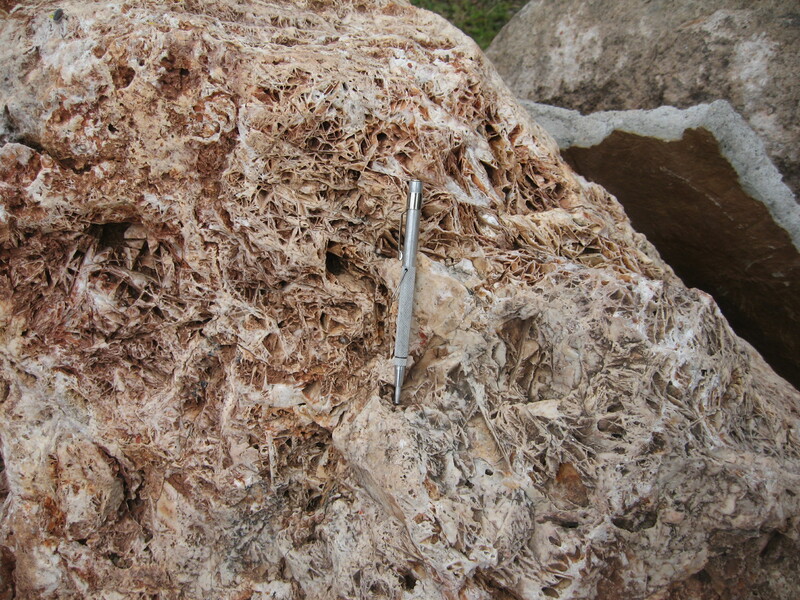 On the picture below, quartz vein showing lattice calcite replaced by silica in a prospect in Hidalgo, Mexico. Photo by Miguel A Heredia. Leisure is the mother of all vices, according to an old Mexican proverb, and having ample spare time during the worst part of the down cycle in the mining industry during 2015 led to creation of this weekly newsletter. First by fueling the creation of the Gambusino Prospector site to publish exploration and mining news, and then noticing that in mid-late 2015 there were news releases worth compiling and spreading, like the private raising of noticeable amounts of cash, and then by compiling the news releases by areas of interest. It was a matter of trial and error until a workable format was born. And remember, there was time available, as the downturn was not throwing much work in our way. The bottom of the downturn was felt in early 2016, with raising spirits in March after PDAC, spirits that continued high through May and Midyear. Things were looking brighter through the end of 2016, but it would take until 2017 for work to noticeably increase in Mexico. The past year has brought relief to drillers and laboratories, as well as some work for geoscientists and other professionals of the exploration area, but full work is still to come. The expectations for this year are high, even if a swing to a full boom is not expected, but a clear optimistic mood can be perceived in the exploration industry. Having said that, compiling and publishing the news releases takes a two or three hours every week day, and compiling, writing and publishing this newsletter takes anything from four hours (a few times in the year) to up to 12 hours in the more extreme cases…… every week of the year. Believe me, we have learnt to dread the times of the year when the quarterly reports are released. Writing the highlights every week is both a pleasure and hard work that satisfies and exhausts. For the last two years Miguel Heredia was taking care of finding and publishing the press releases from companies working in Mexico and I was doing the compression of the information in a few pages. We now have the help of Laura Ramirez in the research and publishing phase, and starting next week Miguel Heredia and I are to start sharing the task of producing the newsletter in alternate weeks. During the 2nd week of the year (January 8th to January 14th, 2018), things come back to normal with at least 30 press releases being announced by companies working in Mexico. ON MEXICO ISSUES, the illegal blockade at El Limon-Guajes mine in Guerrero continues. A government sanctioned process to set a date to clear the issue will be held at the end of the month (the end of the month!). ON EXPLORATION, in Sonora, Riverside is awaiting drill results from its Glor and Clemente projects and announced its intention to drill during 2018 its Cecilia project; Canuc informed the delineation of several breccia bodies at its San Javier project; San Marco released high-grade copper results from a new zone at its Chunibas project. In Chihuahua Golden Goliath is in the process to select drill targets at its San Timoteo project. In Coahuila, Silver Bull announced high-grade channel sample results from underground workings at its Sierra Mojada project. In Durango, Riverside announced its intention to drill the El Capitan project during 2018. In Guanajuato, Vangold is to measure the underground stockpile (backfill) at its Pinguico mine. In Estado de Mexico Impact Silver updated on exploration on the Zacualpan district. In Hidalgo, Prospero released interesting results on the first drill campaign at the El Petate project. ON MINING, Seven companies: Torex Gold, Coeur Mining, Hecla Mining, Endeavour Silver, Capstone Mining, Alio Gold and Alamos presented preliminary Q4 and annual production results for 2017. Santacruz Silver announced the commencement of construction work to expand the mill capacity at Veta Grande, Zacatecas. ON FINANCING, Avino Silver is now formally on the TSX. 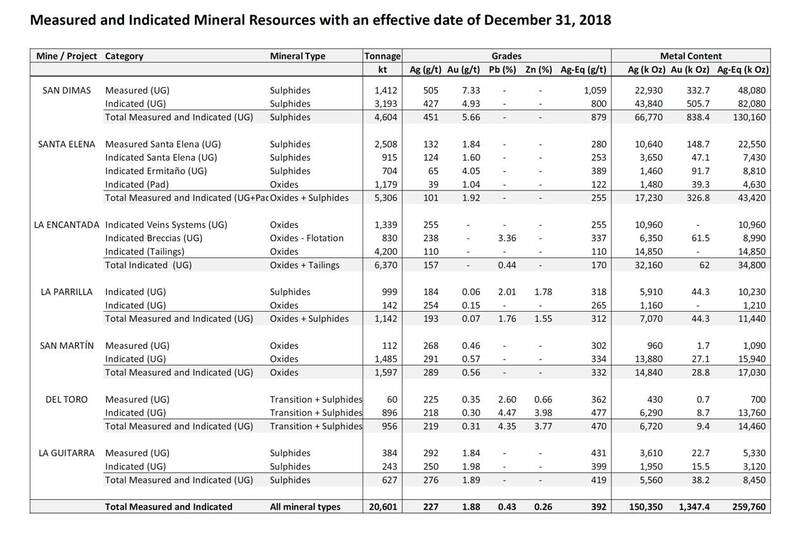 ON RESOURCES AND DEVELOPMENT, Southern Silver updated its resource estimate on Cerro Las Minitas in Durango to over 50 M Oz Ag, 400 M Lb Pb, 1,600 M Lb Zn. Leagold released the high-grade results of the last 15 holes of its 2017 infill and expansion drill program at the Bermejal underground deposit in Guerrero. First Majestic drilled over 800 holes and 156,000 m on its six operating mines and one prospect during 2017. For 2018 its plan is to drill 183,000 m on the same properties and prospect. Minera Alamos has completed the geotechnical reports on the La Fortuna project in Durango, to submit for approval to SEMARNAT. Kootenay Silver is to focus work in 2018 in the expansion of resources and increasing grade on its La Cigarra project in Chihuahua. Mexican Gold plans to focus exploration work in expanding the resource and finding more orebodies at its Las Minas property in Veracruz. Starcore International is to prepare a PEA on the La Fe property in Sinaloa. ON DEALS AND CORPORATE ISSUES, Torex Gold informed two of the largest communities near its El Limon-Guajes mine in Guerrero, Nuevo Balsas and Salvador Trujano, have publicly supported the company and have asked the state government to intervene to lift the illegal blockade. First Majestic has entered into an agreement to acquire Primero Mining in a deal valued in $320 M.
The illegal blockade at El Limon-Guajes mine in Guerrero continues. Torex Gold informed that two communities, Nuevo Balsas and Valerio Trujano have publicly supported the company and have asked the state government to intervene to lift the illegal blockade. The company is using an alternate route to enter and inspect the facilities while a government sanctioned process for selecting the workers union by vote is underway with a meeting scheduled for January 30, 2018, at which time the parties are expected to agree to a timeline for a vote (vote that the blockading union is expected to try to delay). Impact Silver Corp. updated on exploration work at the Santa Teresa target, located on the Royal mines of Zacualpan district in Estado de Mexico. Numerous north-south and northeast striking veins transect the Santa Teresa area, with 197 assays greater than 1 g/t Au and up to 114.5 g/t Au. Half of the veins have extremely low sulfide content. The presence of a feldspar porphyry is considered to enhance the prospectivity of the area. Riverside Resources Corp. informed on its exploration plans for 2018, which include the reception of drill results from the Glor and Clemente projects in Sonora, the drilling of the El Capitan project in Durango and Cecilia in Sonora. New partnerships will be explored to advance the Tajitos, (Sonora), La Silla (Sinaloa), Thor (Sonora) and Ariel (Sonora) projects. Vangold Mining Corp. is to star underground drilling at its Pinguico property in Guanajuato on January 15, 2018. The drilling is to focus on grade definition of the underground stockpile (backfill) which is thought to amount 500 K tonnes, to define grade and metallurgical properties. The phase 2 program is to target the Pinguico vein to depth and on strike. Canuc Resources Corp. announced that several breccia targets have been exposed and sampled at its San Javier project in Sonora. Recent mapping has shown that the Carranza breccia could extend over an area roughly 400 m by 100 m. Select zones of this breccia have previously assayed 238 g/t Ag, 0.7 g/t Au over 11 m and 133 g/t Ag, 1.1 g/t Au over 6.5 m. Another breccia has been mapped on the Jazmin workings, with local high grade silver-gold results. Over 400 samples have been sent to the lab, assays are pending. 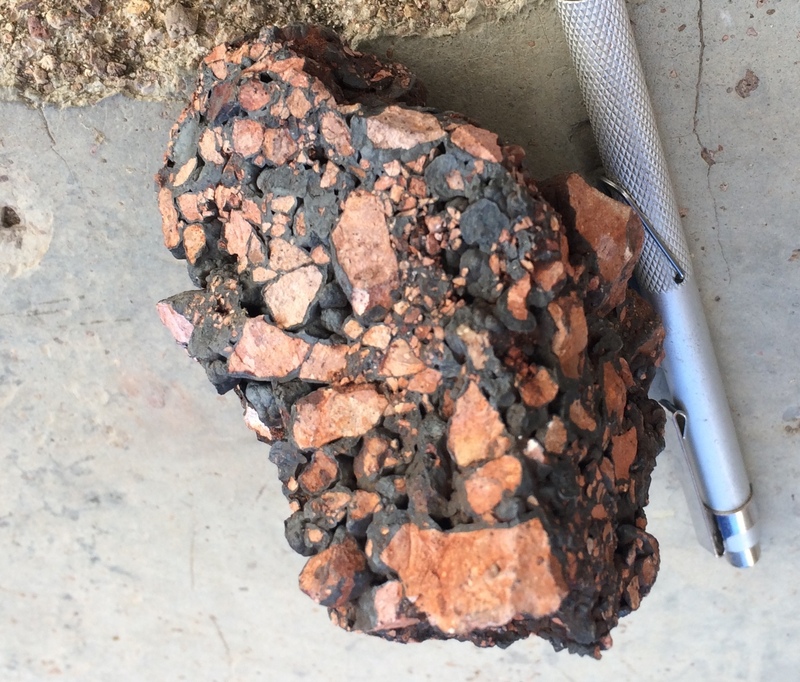 San Marco Resources Inc. released assay results from the newly discovered Cu-Ag mineralization on its Chunibas project in Sonora. 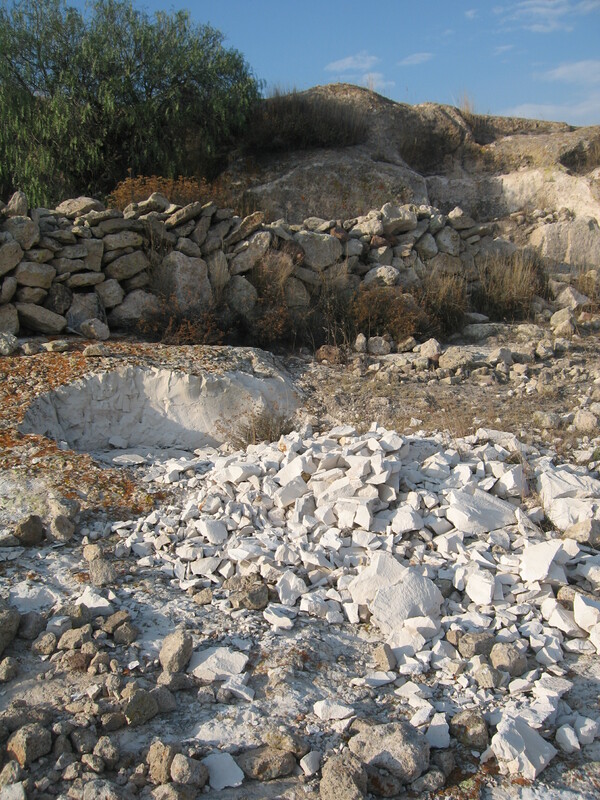 The rock chip sampling followed the recognition of a geochemical anomaly in a soil survey, resulting in the discovery of isolated outcrops on otherwise covered terrain of presumably intermediate volcanic rocks strongly altered by an assemblage of epidote>chlorite>quartz>calcite>specularite. Results of 16 samples include 0.1%, 5.9%, 0.87%, 0.76%, 1.38%, 0.97% 1.8%, 0.41%, 3.72%, 0.25% Cu; 1, 51, 6, 8, 19, 4, 17, 4, 66, 4 g/t Ag. Golden Goliath Resources Ltd. is to complete early in 2018 the drill targeting that was commenced on 2017 at its San Timoteo property in Chihuahua. Past work included a review of past data, including geology, geochemistry, structural geology, geophysics and drilling. Final drafting and final drill target selection remain to be completed. The company anticipates receiving a US$100 K option payment in 2018, and a final payment of US$2.8 M in November 2018. This would provide more than enough funding required for drilling without the need for any further dilution that a private placement would create. Prospero Silver Corp. released drill results from its EL Petate prospect in Hidalgo. Highlights include 24.9 m @ 0.76 g/t Au, 22 g/t Ag; 12.6 m @ 0.51 g/t Au; 16.0 m @ 0.75 g/t Au, 2 g/t Ag; 3.9 m @ 1.18 g/t Au, 4 g/t Ag; 14.7 m @ 0.19 g/t Au, 2 g/t Ag; 1.1 m @ 10 g/t Ag, 1.5% Zn; 10.0 m @ 0.49 g/t Au, 24 g/t Ag; 3.2 m @ 1.96 g/t Au, 34 g/t Ag, 0.1% Zn; 19.3 m @ 0.32 g/t Au, 1 g/t Ag; 12.8 m @ 0.28 g/t Au, 6 g/t Ag. These holes were drilled on the El Tajo and Apartadero SE targets. Prospero is now planning to drill the Pachuca SE prospect, with funding being provided by partner Fortuna Silver. Torex Gold Resources Inc. informed that 241 K Oz Au were poured during 2017 at its El Limon-Guajes mine in Guerrero (The production is for the first 10 months of the year, before the illegal blockade by a union trying to grab a contract that continues to date). Coeur Mining Corp. announced fourth quarter and annual production, including figures from its Mexican operations. At Palmarejo, in Chihuahua, during the fourth quarter 389.5 K tonnes were milled @ 215 g/t Ag, 3.1 g/t Au, with a recovery rate of 87% Ag, 92% Au, to produce 2.35 M Oz Ag, 37,537 Oz Au. During the year 1.5 M tonnes were milled @ 175 g/t Ag, 2.8 g/t Au. Hecla Mining Co. released preliminary silver and gold production results for the fourth quarter and full year 2018, including figures from its operations in Mexico. At San Sebastian in Durango, during the fourth quarter 759.1 K Oz Ag, 5,955 Oz Au were produced, while 3.26 M Oz Ag, 25,177 Oz Au were produced during 2017. Cash and cash equivalents stood at $219 M at the end of the year. Endeavour Silver Corp. produced 4.9 M Oz Ag, 53,007 Oz Au on its three operating mines in Mexico during 2017. During the fourth quarter 1.39 M Oz Ag, 14,577 Oz Au were produced from its Guanaceví mine in Durango, and the Bolañitos and El Cubo mines in Guanajuato. At El Compas in Zacatecas, initial production is targeted on March 2018, At Terronera in Jalisco permits have been received to build the mine and the plant, while receipt of the dumps and tailings permit is awaited. Santacruz Silver Mining Ltd. reports that abiding by the terms of the LOI signed with Carrizal Mining S.A. de C.V., Carrizal has commenced construction works to expand the Veta Grande mill to 750 tonnes per day (tpd). In addition Santacruz has received permit for a surface drill program at the Veta Grande project which includes 6,000 m in 15 drill holes on the first phase, funded by Carrizal.Capstone Mining Corp. released Q4 and full year 2017 production results, including figures from its Mexican operations. At Cozamin in Zacatecas, 219.9 K tonnes were mined in the fourth quarter, 223.5 K tonnes were milled (2,430 tpd) @ 1.98% Cu, 0.71% Zn, 0.06% Pb, 46 g/t Ag, recovering 96.2% Cu, 64.2% Zn, 0.9% Pb, 79.7% Ag, to produce 4,254 tonnes Cu, 1,015 tonnes Zn, 3 tonnes Pb, 263.3 K Oz Ag. During the year, 912 K tonnes were mined and milled (2,499 tpd) @ 1.91% Cu, 0.71% Zn, 0.07% Pb, 43 g/t Ag, with recoveries of 96.1% Cu, 65.5% Zn, 8.0% Pb, 78.7% Ag, to produce 16,732 tonnes Cu, 4,232 tonnes Zn, 50 tonnes Pb, 1.0 M Oz Ag. Alio Gold Inc. informed on preliminary production results from its San Francisco mine in Sonora for the fourth quarter and full year 2017. During the fourth quarter 1.72 M tonnes were processed @ 0.46 g/t Au, 6.23 M tonnes of waste were moved for a total of 7.99 M tonnes mined, to produce 16,070 Oz Au and 7,873 Oz Ag. Alamos Gold Inc. reported fourth quarter and annual 2017 production, including figures from its operations in Mexico. During the fourth quarter Mulatos and El Chanate produced 42,700 and 12,100 Oz Au respectively, and 160,000 and 60,400 Oz Au on the whole year. The budget for development of La Yaqui Grande and Cerro Pelon is $13 M, focusing on engineering, permitting and early stage construction. During 2018 open pit grades mined and stacked on the heap leach pad are expected to range between 0.75 and 0.95 g/t Au. “A total of $13 million and 41,500 m has been budgeted at Mulatos for exploration in 2018 with the main areas of focus being El Carricito, La Yaqui Norte – Halcon, El Refugio, San Carlos and the near mine area”. At El Chanate mining activities are expected to cease mid-2018. Total crushed and run of mine ore is expected to average 9,700 tpd @ 0.69 g/t Au. Avino Silver & Gold Mines Ltd. has received final approval from the Toronto Stock Exchange (TSX) to list its common shares and warrants on January 8th, 2018. Concurrently with the TSX listing, the Shares and Warrants will be delisted from the TSX Venture Exchange (TSX-V) (Avino, Durango). Southern Silver Exploration Corp. updated the mineral resource estimate at its Cerro Las Minitas JV project in Durango (SSV 40%, Electrum Global Holdings LP 60%). The resource was calculated on four deposits: Blind zone, El Sol, Las Victorias and Skarn Front, with 10.1 M tonnes @ 102 g/t Ag, 0.10 g/t Au, 1.4% Pb, 3.6% Zn, 0.15% Cu as indicated resources, holding 33.4 M Oz Ag, 34 K Oz Au, 319 M Lb Pb, 813 M Lb Zn and 8.7 M tonnes @ 74 g/t Ag, 0.04 g/t Au, 0.7% Pb, 4.5% Zn as inferred resources containing 20.7 M Oz Ag, 12 k Oz Au, 131 M Lb Pb, 870 M Lb Zn. Leagold Mining Corp. reported results for the final 15 drill holes at the Bermejal Underground project at the Los Filos mine in Guerrero. These infill and step-out holes intersected high grade intervals like (true width): 4.16 m @ 9.2 g/t Au; 3.05 m @ 8.8 g/t Au; 1.77 m @ 10.1 g/t Au; 1.77 m @ 61.3 g/t Au; 7.43 m @ 12.4 g/t Au; 5.12 m @ 8.1 g/t Au; 3.89 m @ 7.0 g/t Au; 8.08 m @ 5.9 g/t Au; 13.59 m @ 4.75 g/t Au; 6.89 m @ 12.3 g/t Au; 14.08 m @ 20.2 g/t Au; 7.34 m @ 35.6 g/t Au; 10.49 m @ 8.79 g/t Au; 14.33 m @ 8.0 g/t Au; 23.57 m @ 6.1 g/t Au. A total of 111 holes comprising 56,280 m were drilled in this program, from April to December. To date the Bermejal Underground deposit contains 2.1 M Oz Au contained on 10.8 M tonnes @ 6.0 g/t Au. Los Filos currently operates two open pits, Los Filos and Bermejal, and the Los Filos underground mine. First Majestic Silver Corp. disclosed a year-end review of its 2017 exploration program, which includes over 156,500 m of diamond drilling on 807 holes across its six operating mines and the Plomosas project. Highlights include a new discovery at Ermitaño West (in Sonora) with drill TW intersects of 37 m @ 3.0 g/t Au, 50 g/t Ag; 12.9 m @ 4.7 g7t Au, 277 g/t Ag; identification of the Main Vein extension to the west at Santa Elena in Sonora; discovery of the La Fe replacement orebody at La Encantada in Coahuila; discovery of the Cerro de Santiago vein at La Parrilla, in Durango; the extension of the Santa Teresa vein to the south at Del Toro mine in Zacatecas; the continuation of the Hedionda vein in the San Martin mine in Jalisco; the Nazareno northwest extension and the Nazareno de Ancas finding at La Guitarra in Estado de Mexico; the extension of the Plomosas vein and finding a new stockwork system at Plomosas in Sinaloa. For 2018, a 183,000 m drilling program is envisaged across the six operating mines and the Plomosas project. Minera Alamos Inc. has completed the geotechnical studies for the approval of its mine development permits for the La Fortuna gold project in Durango. The study that includes the design of the containment facilities comprise the final data package to be submitted to the environmental authorities (SEMARNAT). Kootenay Silver Inc. informed on 2017 activities at La Cigarra in Chihuahua. The drilling of 37 core holes resulted on significant discoveries In the RAM and Las Venadas zones. Other activities include the re-logging of the entire La Cigarra deposit, mapping and sampling of seven other prospective zones. Work in 2018 is to focus in increasing the current resource and grade at La Cigarra. At La Negra, in Sonora, partner Pan American Silver announced the results of 26 holes from an infill program, including 7.5 m @ 529 g/t Ag within 40.8 m @ 194 g/t Ag. Mexican Gold Corp. informed on work completed during 2017 at its Las Minas property in Veracruz, which includes the completion of an initial 43-100 resources estimate for two of eight known mineralized zones, the completion of 5,873 m of drilling at El Dorado/Juan Bran and Cinco Señores zones, the extension of several zones, the identification of a parallel mineralized zone at Cinco Señores, the completion of geophysical surveys and the purchase agreements on several claims. For 2018 the focus is to expand the initial resource on El Dorado/Juan Bran and the Santa Cruz zone; exploration drilling of the Cinco Señores and Las Minillas zone; the field exploration at the Santa Cruz, Pueblo Nuevo and Changaro zone. Starcore International Mines Ltd. has engaged Global Kompas to undertake a preliminary economic assessment (PEA) of the Santa Fe project in Sinaloa. The property was previously optioned by another company, completing two explorations programs up to 2014 which concluded with no mineral resource, but that discovered multiple veins and mineral ore shoots. Torex Gold Resources Inc. informed on the state of affairs on the illegal blockade at its El Limon-Guajes mine in Guerrero, announcing that two of the larger communities, Nuevo Balsas and Valerio Trujano have publicly supported the company and have asked the state government to intervene to lift the illegal blockade. Access to the mine site has been gained through a road used during construction on the Rio Balsas Ejido land, allowing crews to inspect the site, make maintenance plans and plans to re-start operations if the security of the site can be assured. The government sanctioned process for a workers’ vote to select the union they want to represent them is underway with a meeting scheduled for January 30, 2018, at which time the parties are expected to agree to a timeline for a vote (date that the blockading union is expected to try to delay). First Majestic Silver Corp. has entered into a definitive agreement to acquire all issued and outstanding shares of Primero Mining Corp. by exchanging Primero’s shares for First Majestic shares on the basis of 0.03325 of a First Majestic common share for each Primero common share. Concurrently First Majestic has entered into agreement with Wheaton Precious Metals International Ltd. (WPM) whereby the current silver streaming interest at Primero’s San Dimas Ag-Au mine in Durango will be terminated. First Majestic and WPM are to enter into a new stream arrangement based on 25% of the gold equivalent production at San Dimas, with ongoing payments of $600 per AuEq Oz delivered under the agreement. 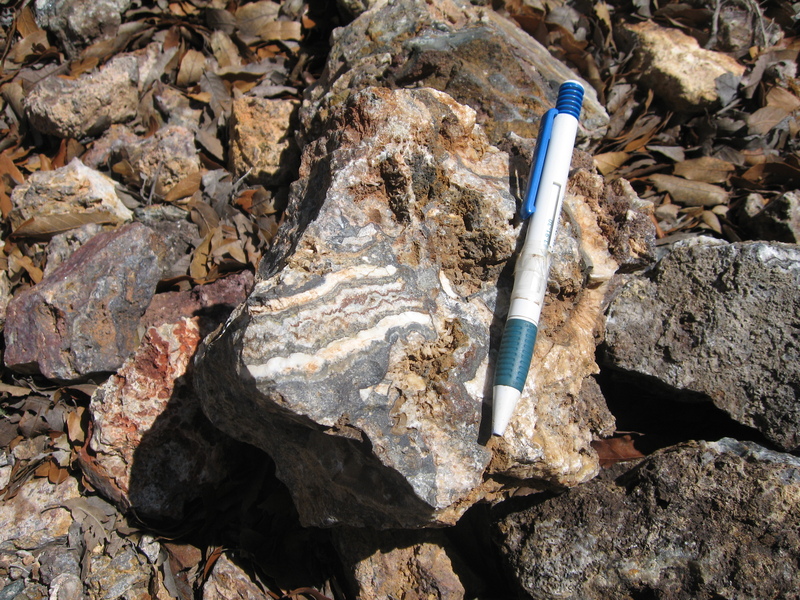 As part of the transaction WPM will receive 20.9 M common shares of First Majestic, valued at $151 M. The total transaction values is estimated at $320 M.
On the picture below, argillitized porphyritic intrusive with quartz veining and minor sericite alteration still visible, in a prospect of the Durango Altiplano. Photo by Jorge Cirett.